Members of cabinet on Wednesday wished Acting President Yemi Osinbajo happy 60th birthday anniversary. They sang birthday song for him after the rendition of the National anthem and opening prayers by the Minister of Water Resources, Suleiman Adamu, and Head of Service, Mrs. Ekanem Oyo-Ita. 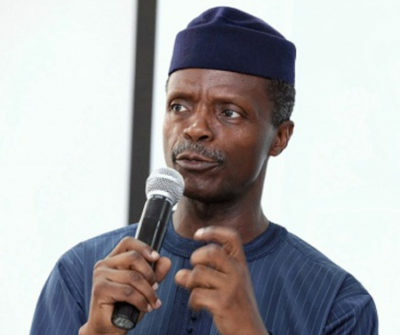 As the Acting President was about to take his seat for the Federal Executive Council (FEC) meeting to begin, the cabinet members remained standing and sang the birthday song. After the songs and good wishes, Osinbajo replied with prayer for the cabinet members. Wife of the President, Mrs. Aisha Buhari, in her Twitter handle, also wished Osinbajo happy Birthday.